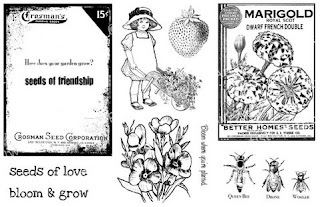 I'm excited to share with you the newest rubber stamp collections from Artistic Outpost: Beyond the Sea, Bloom and Grow, and Country Life. I just loved mixing the images from this release to create my projects! Bloom and Grow has the perfect seed frame that you can use with so many of Artistic Outpost's stamps, I think I used it on almost all the samples I created for this release! For a limited time, you can enjoy all three collections together for a special price. From now until June 4th, purchase all three sets together for $36, that’s a savings of 15%. Simply use coupon code: SUMMER2010 at check-out. I showed my DH all the lovely creations I created for this release and asked him to pick his favorite from each plate for my blog post today. 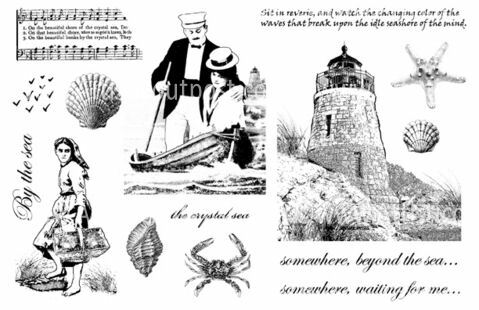 Beyond the Sea Features interchangeable main images including the perfect lighthouse, alluring couple, and longing clam digger. Perfect for cards, shadow boxes, and scrapbooking. 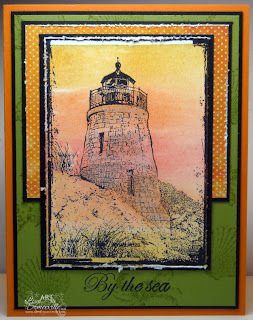 My first card uses the Lighthouse from Beyond the Sea, and the Seed Packet from Bloom and Grow. I started out by stamping the Lighthouse, then masking it with Eclipse Tape, and added the Bloom and Grow Seed Packet, doing a little omitting, so not to get the words. The image is colored using the Spectrum Roll Technique, then I highlighted the colors with Distress Inks. The shells are stamped in Olive on the Olive Panel. 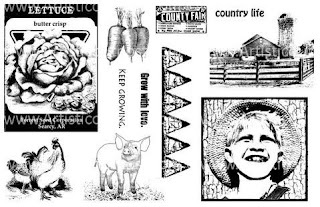 Bloom and Grow and Country Life represents two halves of one whole. 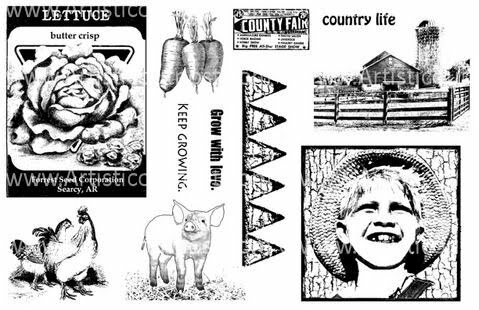 Bloom and Grow features more feminine elements while Country Life includes a little more fun “boy” imagery including the cutest little pig, chickens, and little boy. See I told you I just LOVE this frame! The images from the sets fit perfectly inside the frame. On this card, I paper pieced her dress with some Cosmo Cricket papers, added a little bit of Marker Watercoloring and some Flower Soft. 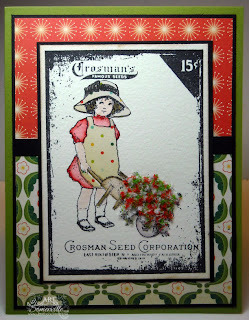 This card also features the frame from Bloom and Grow and images from Country Life. Again, a little bit of Masking and some Marker Watercoloring to add color. Don't you just *love* that little pig! Thanks so much for stopping by! Be sure to stop back later this weekend, I've got more artwork to share using these fun new plates! Lisa Your Beyond the Sea looks like a Beautiful Sunrise and your others remind me of Idaho! great job Lisa - you are amazing! Beautiful release, luv these new sets and what you have done with them! Beautiful Lisa! Your coloring is always just perfect! I am really liking these new sets! 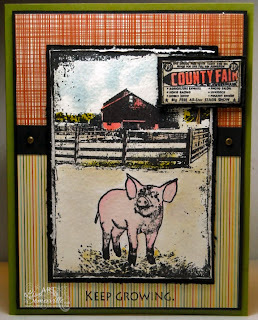 Lisa, Love all of your creations, Wonderful job as always, Fabulous release cards. Sorry i left your comments on Shelly's blog, oops LOL. I was so inspired by your artwork for these sets! Fantastic cards. Oh, the piggy and lighthouse are my favorites!!! Love that lighthouse ... and that little pig is just too fun. 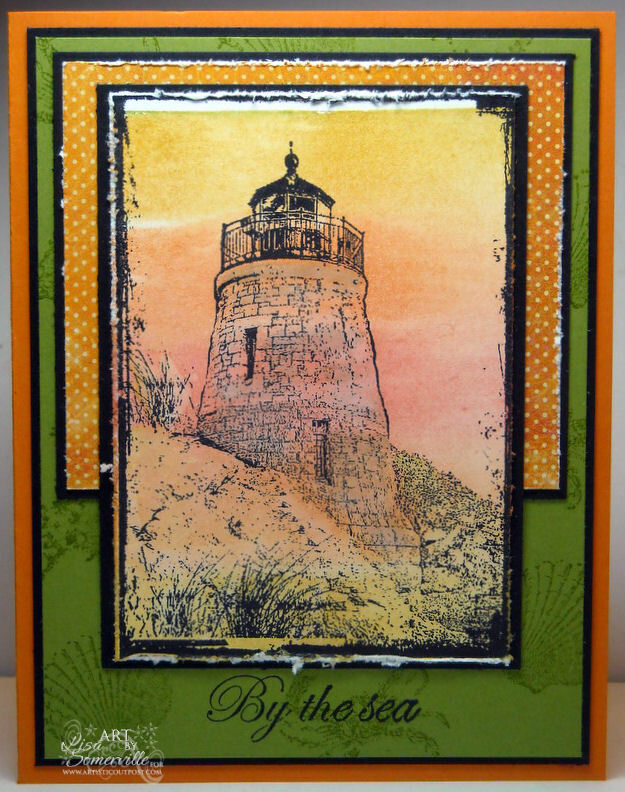 Wonderful color on your Beyond the Sea card! Beautiful! Love your other samples, too. The seed packet frame is so versatile. 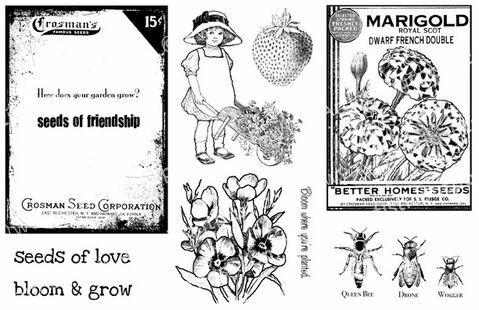 Love all your projects with the lovely stamps. The pig is cute! Love the little girl and how you colored her in and the design of the card too. You're combinations of colors and images are so cool. 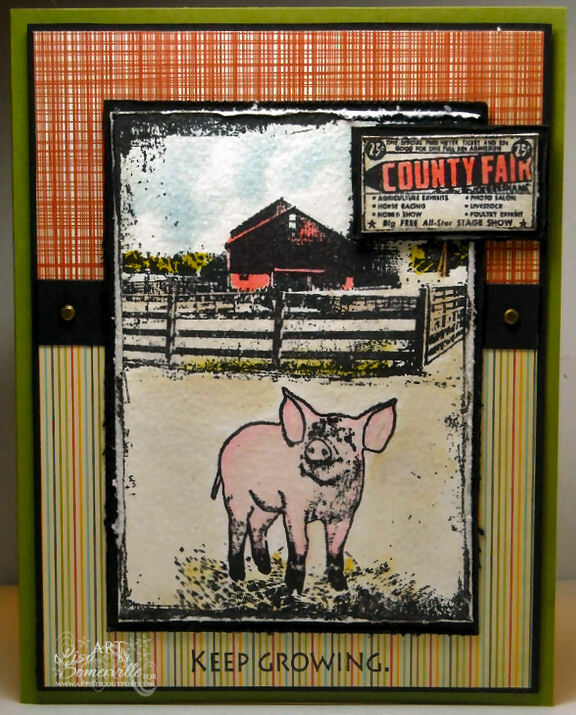 I just love love love that pig card! ACK--love it:) All of these cards are wonderful!